In The Life of Reason, George Santayana famously notes that those who cannot remember the past are condemned to repeat it–or, as the popular interpretation of this dictum would have it, that we need to learn from our mistakes. 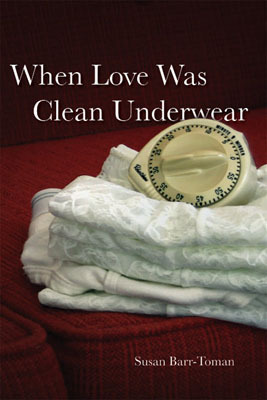 The problem that Lucy Pescitelli, the protagonist of Susan Barr-Toman’s debut novel, When Love Was Clean Underwear, faces, however, is that she doesn’t have much of a past to speak of and, as a result, hasn’t made the mistakes that the rest of us made in our teens with respect to dating, friendship, and relating to other people in general. As a result, she spends much of the novel attempting to navigate the choppy waters of adult relationships–something she’s never done, despite the fact that she’s nearing thirty. The novel begins with Lucy agonizing over her dying mother’s request to be euthanized. That she carries out her mother’s wishes by smothering her with a pillow is entirely fitting, as the mother has been smothering Lucy with her own brand of “love” for over a decade. Indeed, despite her death, the mother’s presence is palpable throughout the novel. She haunts Lucy night and day, causing the protagonist to vacillate between doubting her every instinct and feeling guilty for everything she does. Compounding the problems that Lucy must overcome is the South Philly neighborhood where she resides. In effect, the South Philadelphia that Barr-Toman has created is the ghost of Lucy’s mother writ large. Its will is unbending, its assumptions uncompromising, its outlook provincial. It is, in short, a closed universe with its own rules and regulations, both spoken and unspoken, that hem Lucy in, almost to the point of claustrophobia. Lucy, to put it bluntly, is in an inescapable (though well-meaning) circle of hell consisting of row homes, nosy neighbors, and not enough parking. Given Lucy’s lack of prospects, the challenge that Barr-Toman faces as a writer is taking a character who’s never stood up for herself and making her do so. To put it another way, the challenge is taking a figure who isn’t quite a character yet (i.e., she has no sense of self outside of her mother, no real motivation outside of a vague wish to keep her crime a secret) and to allow that figure to blossom into full “characterhood.” That When Love Was Clean Underwear is a character-driven novel makes this challenge all the more daunting, yet it’s a challenge that Barr-Toman meets expertly by filling the early chapters of the novel with a cast of memorable characters who pick up the slack for Lucy and from whom, as the novel progresses, must wrest control of the narrative that is her life. The end result is a lovingly crafted coming of age story that gradually (and almost without warning) builds to a hard-fought, spirited declaration of independence. 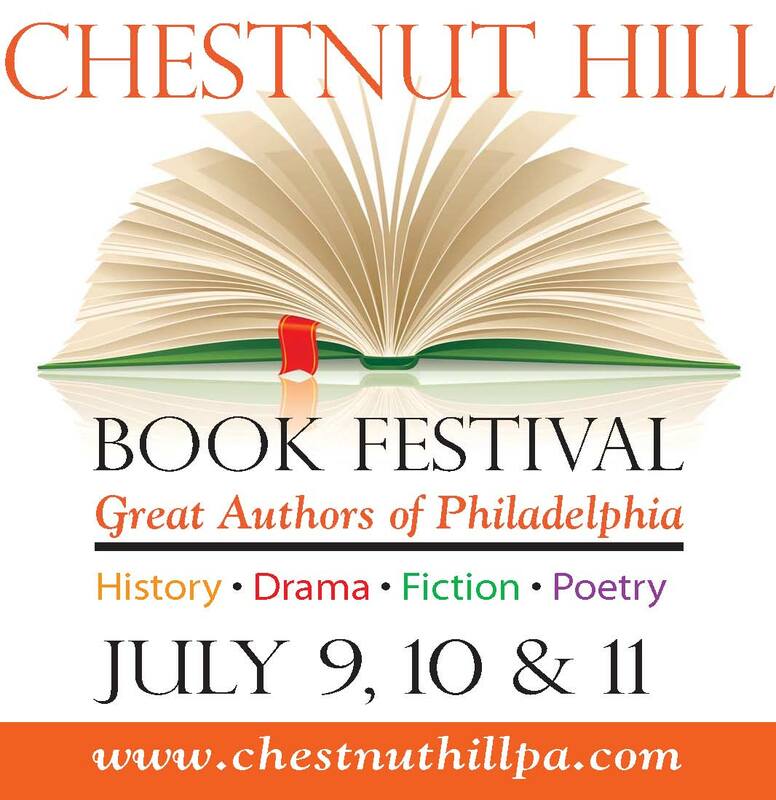 The second annual Chestnut Hill Book Festival on July 10th, and 11th will feature over 50 locally and nationally recognized authors. You have a great idea. You’ve always wanted to write. You used to write but haven’t in years. This hands-on workshop will offer tips and strategies to wake up that muse and get writing! How can you grab readers from the start, hold them through the middle, and leave them satisfied at the end? This hands-on workshop will explore the writing process and help you shape your characters, plot, and voice into a dynamic story. You’ve gotten your first draft done. Now what? This workshop will discuss how to polish the language, characters, and structure of your story. Sunday, July 11 (12-4): Get great marketing tips and a chance to learn about the local literary scene at these panel discussions. Workshops are $10 and open to the public. Space is limited, so please email christine@philadelphiastories.org to reserve a seat. Getting connected (12-1:30): Trying to connect with other writers or figure out the best place to get published? This panel discussion will cover the local literary scene, including how to find workshops, retreats, readings, and other great community events for writers. Panelists include: Alison Hicks (Wordshop Studio), PR guru Don Lafferty, and more. Tips for Marketing Your Book- (2:30-4): How do you get your book noticed when you are competing with thousands of other new titles? This panel discussion will cover how to find a publicist, marketing your book in a 2.0 world, getting media coverage, and more. Panelists include: Elise Brown, author Marie Lamba, author Nancy Viau and author Scott Heydt. Other fair events will include author readings, signings, panel discussions, writer workshops, poetry slams and more. For children, there will be storytelling, costume parades, and other fun activities. 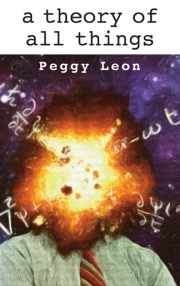 It’s hard not to fall in love with Peggy Leon’s latest novel, A Theory of All Things, a comic drama that studies the competing forces of order and chaos inherent in all families. Representing order, more or less, is a character named Mary, the eldest sister and self-appointed lynch pin in a family of geniuses that appears, at first glance, to be hell-bent on falling apart. At the other end of the spectrum is Mark, a brilliant physicist whose faith in entropy is rivaled only by his social awkwardness. Filling in the spectrum between them is an array of artistically gifted siblings, absent parents, and hapless lovers caught in the crossfire of the family’s simmering yet mostly unspoken rage. Not since the opening chapters of Don Delillo’s White Noise have family matters been so complicated–or so true to life. To tell the story of the dysfunctional Bennett family, Leon adopts the voices of all of her major characters. As a result, the narrative takes on a confessional quality, especially since each narrator is so willing to bear his or her soul to the reader. Yet here lies the heartbreaking beauty of the novel: even as the reader begins to understand where all of the discord within the Bennett family is coming from–and how much the siblings all really love each other–the characters never come to the same conclusions. The problem, of course, is that they’re not really talking to each other. They’re bottling their emotions and storing them for later use, all the while increasing the tension that drives the novel so forcefully forward. Despite their differences and personality quirks, the Bennetts are a lovable family. Indeed, one of Leon’s major gifts as a storyteller is knowing how to keep the pressure building inside a narrative without blowing it apart. For the most part she does this with humor. Mark’s efforts at losing his virginity at the age of 36, for example, are as a funny as they are misguided. At the same time, though, Leon is also adept at inducing pathos, particularly with respect to the Bennett patriarch, Frank, whose losing battle with Alzheimer’s is accompanied by a tendency to wander both physically and mentally through the confusing landscape of his rapidly deteriorating memory. All told, A Theory of All Things speaks both intelligently and emotionally to the complex nature of being in a family–or in any relationship, for that matter. Stylistically, Leon does a wonderful job of bringing the novel’s disparate narrative voices into harmony with each other. While this technique is, in some ways, reminiscent of Virginia Woolf’s The Waves, readers will likely find a stronger parallel between this novel and Wes Anderson’s The Royal Tenenbaums, or between the Bennetts and J.D. Salinger’s Glass family. All of this, of course, is to say that A Theory of All Things is in great company.